Ms. Marvel #1: A Handy Guide to Muslim Stereotypes? 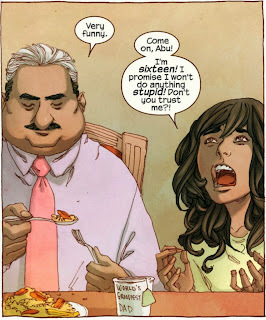 Kamala Khan, the new Ms. Marvel. The new Muslim Ms. Marvel. The new Ms. Muslim Marvel. Did I mention she's Muslim? Also, teen angst. But mostly Muslim. With Northstar's wedding and other such acts of diversity firmly under their belts, Marvel is showing themselves to be wonderfully progressive. 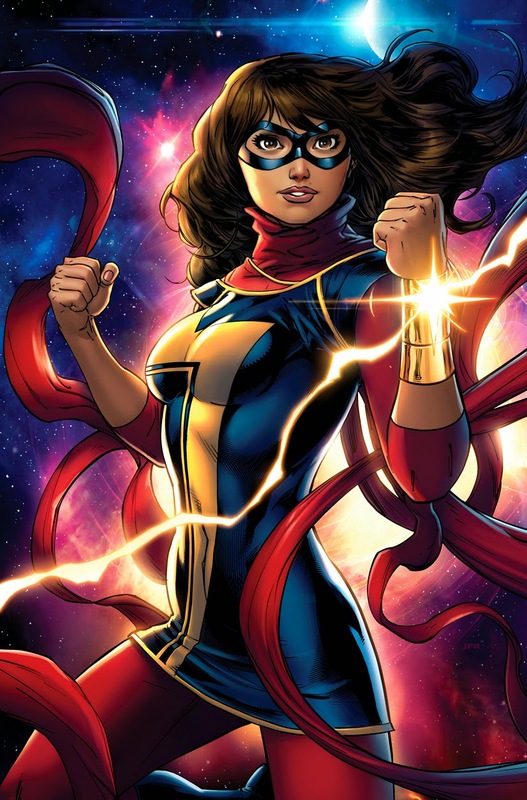 Most recently, they introduced Kamala Khan, a young Muslim girl who is the face of the new Ms. Marvel book. A solo female lead who is a person of colour and of a religion that tends to stir up controversy, written and created by Muslims? Holy inclusion, Marvel! There are, shockingly, detractors, but mostly the praise has been very high for the first issue and at one point, Comixology tweeted that Ms. Marvel #1 was their #3 selling comic that week. Sometimes, high praise makes me suspicious.... though I'd already been cautiously optimistic about this book when I learned that it would be written by G. Willow Wilson. Wilson is an American who converted to Islam. She is an experienced comic book writer, and has earned accolades for her genre-bending novel, Alif the Unseen. Alif the Unseen takes place in the Middle East, starring a young, blasé hacker in love with the wrong woman. I really liked the way Wilson made both the hacker culture and the Middle Eastern culture and all its internal conflicts accessible to me as an outsider, while still, I hope, being respectful to the cultures themselves. I particularly loved the portrayal of women, where our preconceived notions about the treatment of women was very subtly turned upside down through a powerful character named Dina. It was an eye opening adventure that I really enjoyed -- until the introduction of "the convert." Through this character, (whom Wilson claims is not modeled after herself), the author turned the book into a raging opinion piece, complete with jabs at western (American) culture and its blind ignorance. Back to Ms. Marvel #1, where we meet Kamala Khan, hovering before a display of bacon, the "tasty infidel meat" that is forbidden to her for religious reasons (how would she know it's tasty if she's never had it before?). From here, we parade through allllll the Islamophobic stereotypes, many of which are perpetrated by Zoe, the blond and blue-eyed popular (mean) girl whom Kamala thinks is really nice. Move on over to Kamala's home, where, apart from a cute interlude where she is writing Avengers fanfic, we get to see more stereotypes at home, with the added bonus of teen angst because Kamala's dad won't let her go to a party that has boys. In a shocking turn of events, Kamala, the angsty teen, sneaks out to the party and discovers that the people there are prejudiced jerks. Her one understanding friend, Bruno, rescues her after she's tricked into sipping alcohol, and then there's... some mist stuff... and the Avengers Trinity appear in a dream sequence... and stuff... ah sorry. Spoilers. Anyway, that's about 90% of the issue dedicated to marching out all the apparent stereotypes and tropes Wilson could think of, reminding me of the first issue of Aquaman, where the King of Atlantis is subjected to every negative thing that makes him the laughing stock of the Justice League. 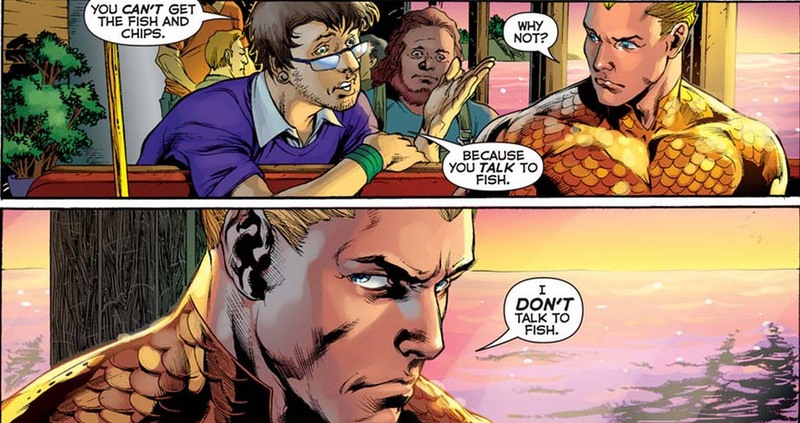 Don't be silly, Aquaman. We totally know you talk to fish. But where we can laugh at Aquaman for talking to fish, Kamala and her issues are meant to make us feel politically correctly uncomfortable. Am I, as a non-Muslim, supposed to suddenly understand her plight and pity her? Empathize with her? Feel guilt for how I have wrongfully treated Muslims? Pat Marvel on the shoulder for making me aware of my ignorance and spearheading this new wave of diversity by tapping into the lucrative Muslim reader market, similar to the way they tried to bring in Black female readers by forging a wedding between Storm and Black Panther? Based on the praise the book is getting, it feels a lot like all of that is what's going on, with no one noticing the fact that Kamala's introduction has been pretty basic. Her character is very shallow without the tropes to hold her up, and the plot, well... no clue there. Sure this is only the first issue, but I've read enough first issues that have done a much better job of plot and character development within only a few pages, so I'm not going to blindly praise this book just because she's something new. Because frankly, she's not. "Kamala's identity crisis bothers me as well. Jews, Blacks and Muslims have all been told that surely they cannot reconcile a "Western" identity with their ethnicity, race or religion. Surely, the clash of civilisations manifests in their personalities and they are troubled, if not schizophrenic. For me, this identity crisis is over-theorised by academics, politicians and journalists, because in the real world, minorities find it quite easy to adapt, integrate and just get on with their lives. At most, they face just as many tricky questions about their identity as anyone else does." "If a cartoon character was to do anything about challenging Islamophobia, it would be one whose Muslim identity is there but is insignificant - just a taken-for-granted part of their life. Or it would be one who comfortably practises Islam without it being a burden. In this regard, I would be more excited about Kamala if she was a superhero who just happened to be a Muslim, or if she wore a headscarf without it being an issue." It might seem like I'm ungrateful about Marvel's attempts at diversity. They've thrown PoC, LGBTs, and other religions all these bones and here I am spitting them out. I most certainly do appreciate being thought of, but I despise tokenism as much as I despise hand outs. I absolutely want to see greater diversity in the various forms of entertainment around me, and appreciate the steps forward, but I cannot wait for the day when a character's skin colour, religion, physical or mental impairment, and/or sexual orientation is neither headline news or a marketing ploy.